Fleas are blood-sucking ectoparasites. There are 2,200 flea species known in the world today. Only a few of these commonly infest dogs and cats. Fleas are not the same as ticks. The most common flea that affects both dogs and cats is the cat flea, or Ctenocephalides felis. It’s dark brown or black body is about one to three millimetres long. They can also feed on people, but we’re not their first choice of meal. Sample of an adult flea. Fleas can be very fast moving, so it can be difficult to see the adult fleas on your pet. It is often best to check for flea dirt. Why do cats & dogs get fleas? Adult fleas have specially adapted mouth parts for piercing the skin and sucking blood. More than just annoying and irritating to your pet, they can also cause significant skin disease. Fleas love warm, humid environments. And they are determined, nimble creatures capable of Olympian feats. When they’re hungry and looking for a home, they can jump 10,000 times in a row up to 60 centimetres high. Plus their flat bodies allow them to move quickly through a pet’s fur. You’ll usually find fleas on your pet’s abdomen, the base of the tail and the head. However, a heavy infestation can thrive anywhere on the body. What are common signs that my pet has fleas? Fleas are small, and just because you don’t find one on your pet, it doesn’t mean that they’re not there or that your pet is not being bitten by them! Above is an image of what flea dirt may look like if you part your pet’s fur to look for droppings. If you have a flea comb, you can comb your pet (try near the base of the tail) to see if you see black debris on the comb. To test if this is flea dirt or just dirt put it on a paper towel then dampen the debris to see if it turns red. If it does, then you know you have found flea dirt. cannot be harmed by insecticides. What do fleas do to pets? Adult fleas have specially adapted mouth parts for piercing the skin and sucking blood. More than just annoying and irritating to your pet, it can also cause significant skin disease. Flea blood feeding is also associated with the transmission of several infectious diseases to both pets and people. In pets, fleas can carry tapeworm eggs, that can be passed into your pet if a flea is ingested while grooming. What is flea allergy dermatitis (FAD)? It’s an itchy skin disease animals develop from an allergic reaction to the saliva of fleas feeding on their blood. An affected dog will be very itchy – often from scratching, biting, licking and chewing. Their skin is usually reddened and there may be lesions and hair loss. Yersinia pestis – causes Plague, an identified agent of bioterrorism. How can I treat or prevent fleas? Products such as Revolution, Sentinel, Advantage or Advantix can be used to treat, control and prevent flea infestations, as well as control flea allergy dermatitis. If you have a flea infestation, it is a good idea to combine a product for your pet with a spray for the house, to help eliminate the infestation faster. Flea preventatives should be used year round. Your vet will be able to help you choose the right one for your pet. Thanks for the info about fleas. Found them on our Maltese. Took him in the shower. cleaned well with a natural cleaner made from plants. Worked well. this was three weeks ago. Now, every day we find 2 to 5 fleas in the shower stall. kill them by spraying with the liquid soap and more are thee the next day.!! do you think the eggs get lodged in the drain? Thanks for taking the time to read the article on fleas. If you are still finding fleas in the house you may need to get a house spray as well. If you are finding them in the house, they will likely be on your pet as well. 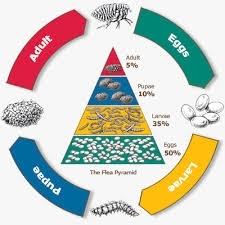 You need a product that will kill all life stages of the fleas, otherwise you will have a cycle of killing the adult fleas, then more eggs hatch a few days later. Feel free to call the clinic to discuss flea life stages & treatment with our staff!